A comical own goal from Djimi Traore helped Burnley stun an inexperienced Liverpool side and book an FA Cup fourth-round clash with Bournemouth. 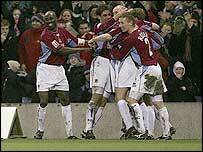 Burnley had the better of the first half and Jerzy Dudek saved well from Richard Chaplow and Micah Hyde. Traore clumsily dragged the ball in from a Chaplow cross when there appeared to be no danger. Chaplow fired just wide before Antonio Nunez was sent off for a clash with Tony Grant in the closing minutes. Right from the start Burnley coped far better with the strong winds and a pitch which had taken a battering from the elements. Dudek denied Chaplow after a through-ball from Jean-Louis Valois, and then kept out Micah Hyde's drive. Gary Cahill headed just over and Hyde went close with a volley as Liverpool's young team struggled to establish a foothold in the tie. The visitors finally came into the game towards the end of the half, but apart from a weak Igor Biscan header there was not much to shout about. Liverpool could only get better and Florent Sinama-Pongolle headed over Nunez's cross soon after the restart, but almost immediately Traore had his moment of madness and his side were chasing the game. Reds boss Rafael Benitez sent on Milan Baros for Traore and the Czech star's arrival perked up his team-mates. But Chaplow almost killed them off when he fired across Dudek and Liverpool's misery was complete when Nunez lashed out at Grant late on. Burnley: Jensen, Sinclair, Cahill, McGreal, Camara, Hyde, Grant, Roche, Chaplow, Valois, Moore. Subs Not Used: Coyne, O'Neill, Pilkington, Scott, Yates. Liverpool: Dudek, Raven, Hyypia, Whitbread, Traore (Baros 65), Nunez, Biscan, Welsh (Mellor 75), Potter, Warnock, Sinama Pongolle. Subs Not Used: Otsemobor, Harrison, Smyth.